One Ibadan man, Muyideen Salaam, a 35 year-old apprentice at Aketegbo community in Seme, Badagry area of Lagos, has been arrested for killing a 13 year-old boy, Rilwan Amuda, for money rituals. The suspect claimed he resorted to money ritual after his wife left with their two children when feeding became an uphill task for him. The suspect in his confession according to vanguard explained that: “ I was alone in the video shop club owned by my master when one of my friends named Nuru came and said he knew someone who could make us rich . He told me all that was needed was just the blood of a boy of about 15 years of age. He said all I needed to do was to get the person since he had already contacted a herbalist. In my desperation, I told him we would take Rilawan, mama elewa’s son since I had easy access to him because he usually ran errands for me and sometimes I gave him money and used closthes. We felt it was useless to go out and get someone else since Rilawan stayed in the same area with us. I made him understand that getting someone was not the problem but taking him to the herbalist’s shrine where he would be killed. When we told baba our constraint, he gave Nuru a ring and instructed us to just touch whoever we wanted to bring with it , that the person would follow us without hesitation. On that fateful day, I called Rilwan and touched him with the ring . To my surprise, he became dumb and followed us to the shrine. We kept him there until it was dark . When it was midnight and there was no one in sight, we took him away from the shrine and laid him on the ground. While Nuru slashed his throat with a knife given to us by the herbalist, I held a bowl close to his neck for the blood to pour into it. Rilwan did not put up any resistance as promised by baba because he was hypnotized. And his memory was gone. After we collected the blood, we gave the bowl to baba and carried Rilawan’s body far away from the shrine to avoid suspicion and dumped it on the expressway so as to give an impression that he was hit by a vehicle. We thereafter, went to bath with the blood as instructed by baba. He performed some rituals fore us and mixed the blood with a black native soap and gave us to bath with after which he said we would become rich. But after bathing with the substance, by the third day, we did not see any money as promised by baba. We were as poor as we used to be . We were so angry and decided to go to baba’s place to fight with him. But on our way, Rilwan’s mother held me and asked me to produce his son for him. She said she was informed that he was last seen with me. She vehemently refused to let go of my trouser even when I denied. This caused a scene and people gathered around me and started beating me. Nuru who was with me managed to escape. Policemen from Seme division came and took me away. It was at that moment I opened up. But Nuru who lured me into it is nowhere to be found . I am left to bear the brunt alone . If I had known, I would have continued working for my master where I was paid N1,500 every month. The most painful aspect is that I do not have a mother, father, sister or brother. I am just all alone in the world. I do not want to die even though I partook in killing somebody “, he said in an emotional laden tone. After his arrest, policemen reportedly took him to the herbalist shrine where the suspect showed them the bowl that was used to drain Rilwan’s blood. The herbalist identified as Soji Akodiya did not deny demanding for a human blood from Muyideen and his fleeing friend but he stated that the killing never took place in his shrine. But Muyideen interrupted saying “It is a lie. You knew when we brought him. It was even you that gave us knife and a bowl to put the blood. You even told us not to kill him in your shrine for security purpose and you were aware we were going to kill him that night”. But the herbalist ignored the interjection and continued “ I am a herbalist who speacialise in attending to barren women. I also help people to get jobs and also give charms to traders to sell more than their fellow traders. I collect, N50 to N500 , depending on what the oracle demands. It is then left for my clients to appreciate me. I got money ritual charm from a colleague ten years ago when all herbalists went for a meeting in Ijebu-ode . Usually, what we do at such meeting is to help ourselves. For instance, if I have the cure for any disease and others do not, I will give to them and vice visa. 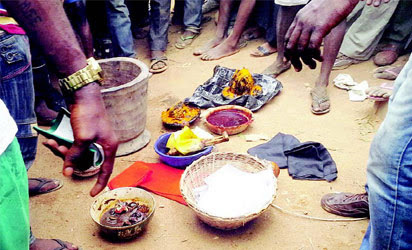 That was how the baba gave all of us ogun owo (money ritual charm)and instructed us on how to administer to our clients . I have never used it before, this is my first time. It was even when Nuru came to me that I realised I had the charm”. Asked why it did work for the suspect and his fleeing partner in crime, the herbalist relied “ it did not work because they did not follow my instruction. The instruction was to bathe with the prepared concoction nine days after its preparation but they used it on the third day. Had they followed the instruction, they would have noticed a total turn around in whatever they set their hands to do . Their businesses would have been lucrative . And if they leave N1000 in the bag, they would wake up to meet triple of what was there”.